Julie Nunes, RN, MS, CPHRM, is the Northern California Regional Director of Risk Management for Kaiser Permanente. She organized and co-chairs the Regional Risk Management Patient Safety Committee, which oversees loss prevention for the Northern California Region. She has brought to Risk Management many of the concepts and methods of Continuous Quality Improvement, System Safety, Human Factors and High Reliability Organizations. These principles are implemented in three of the projects of which she is the Principal Investigator: the Perinatal Patient Safety Project, which won Kaiser Permanente’s Lawrence Award for Innovation in 2004, and the Medical-Surgical Patient Safety Project with Rapid Response Teams 2006 and the HEROES for Safety Project in 2007. Ms Nunes is both a National Patient Safety Foundation Leadership Fellow as well as an Institute for Healthcare Improvement (IHI) Improvement Advisor Fellow. Ms Nunes has been showing her paintings of landscape, still life and the figure in the San Francisco Bay Area for many years. She works primarily in oil on canvas or panel. She is a native Northern Californian and is drawn to explore the light, shadows, and patterns of the landscape of this area. She is excited by color, intrigued by patterns and textures and by the natural compositions of positive and negative space. Barbara and Julie Nunes have been painting together for many years. They met at a designated spot each weekend and paint en plein air. On this day it was raining so they were stuck in Barbara’s studio. 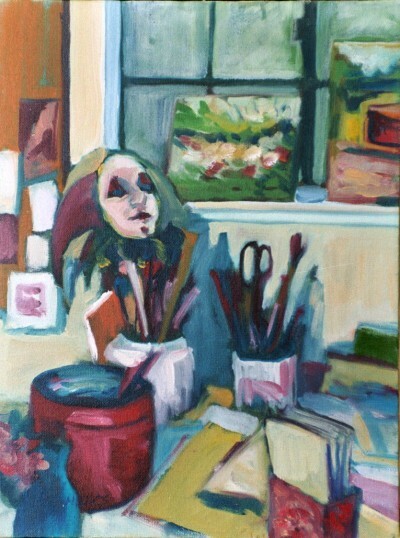 Ms Nunes looked around for a still life to paint and saw Barbara’s cluttered desk. She was intrigued by the Harlequin hand puppet, one that she used in her commedia dell’arte acting. Julie says she did not move a thing, just painted what she saw.